NJPA's Division of Academic & Scientific Affairs is pleased to announce several awards that will recognize the accomplishments and scholarly contributions our students and colleagues. All applications are due July 5, 2019 and will be presented at our Fall 2019 Conference. Self-nominations are encouraged and nominees need not be members of NJPA. The Committee on Academic and Scientific Affairs reserves the right to make all final determinations on which awardees will be selected. Professional awards recognizing the contributions of psychologists in the state of New Jersey will be offered during our conference. These awards include 1) The Distinguished Researcher Award; 2) The Distinguished Teacher Award and 3) The Emerging Researcher Award. Our division offers three student awards: 1) Undergraduate Student Researcher Award; 2) Graduate Student Research Award; and 3) Master’s Thesis and Doctoral Dissertation Awards Application. All award recipients are invited to attend our Fall Conference Award Ceremony where their work and contributions are recognized. Student award recipients are invited to present their scholarly work at a poster session held during the conference. To submit a nomination, please click here. 1. Name, terminal degree of candidate, and institutional affiliation. 2. Contact information—mailing address, telephone number & email of candidate. 3. Title of research presentation, thesis or dissertation if appropriate (depending on the award). 4. A 500-word statement describing the candidate's contributions/ reason for the nomination. The Distinguished Researcher Award is given to a psychologist who has a distinguished record of research in any area of psychology and holds a full-time academic or scientific position. Awardee receives a certificate and can select a graduate student to receive a $300 scholarship in the award recipient’s honor. The Distinguished Teacher Award is given to a psychologist who has a distinguished record of teaching in any area of psychology and holds a full-time academic or scientific position. Awardee receives a certificate and can select a graduate student to receive a $300 scholarship in the award recipient’s honor. The Emerging Researcher Award is given to a psychologist who has made a substantial contribution to research in any area of psychology, is a full-time academician or scientist, and has received a doctoral degree within the past 10 years. Awardee receives a certificate and $100. This award is presented either to an undergraduate psychology major attending a New Jersey college or university who has demonstrated exceptional research potential as determined by his or her academic department. This award is presented to a graduate student in psychology who is either attending a New Jersey college or university or interning in a New Jersey institution or an NJPA student affiliate, who has demonstrated exceptional research potential as determined by his or her academic department. This research should have been completed within the last two years. The awardee is invited to present his/her research as a poster at the NJPA Fall Conference. This award is presented to graduate students in recognition of outstanding scholarly work, Master’s Thesis or Doctoral Dissertation, from any specialty within a psychology graduate program in New Jersey. The works nominated should be superior in quality, design, and especially, represent a significant contribution to psychology or society as a whole. Each graduate program is asked to nominate one student in each category. On behalf of the New Jersey Psychological Association’s Division of Academic & Scientific Affairs, you are invited to submit proposals of your scholarly work for NJPA’s poster hall section of the Fall 2019 Conference being held November 1-2, 2019. Submissions should discuss research (for example, psychological research, clinical research, applied research etc.) that has not been presented or published elsewhere. All submissions will be reviewed and evaluated by a review committee. Although membership is not required for submission, please note that there is a special member registration rate for the conference and all presenters must register for the conference. We welcome your involvement in our organization and encourage you to seek membership in NJPA or become a student affiliate member. To submit a Poster Proposal, please click here. NJPA offers several award opportunities, for members and non-members, in the areas for research and teaching, thesis and doctoral dissertation, and graduate student awards through the NJPA Foundation. We hope you will take the time to read about these offerings and consider nominating yourself or another worthy individual. 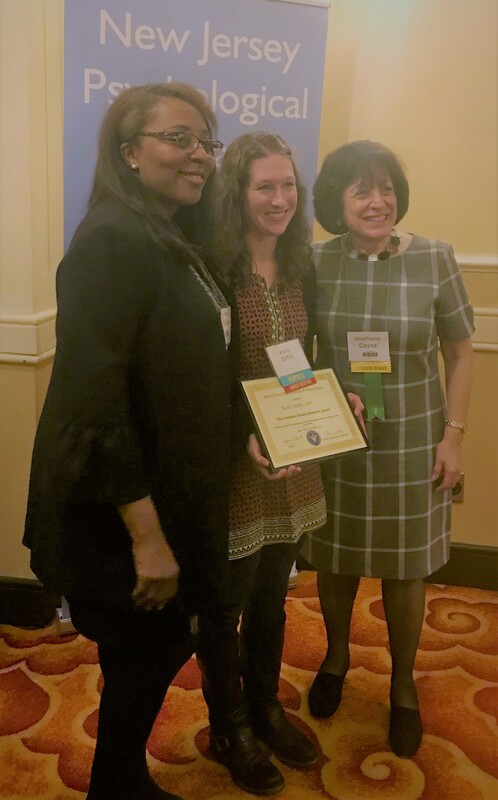 The New Jersey Psychological Association’s Division of Academic & Scientific Affairs is pleased to announce several awards that will recognize the accomplishments and scholarly contributions our students and colleagues. Self-nominations are encouraged and nominees need not be members of NJPA. The Committee on Academic and Scientific Affairs reserves the right to make all final determinations on which awardees will be selected. 1) The Distinguished Researcher Award: is given to a psychologist who has a distinguished record of research in any area of psychology and holds a full-time academic or scientific position. Awardee receives a certificate and can select a graduate student to receive a $300 scholarship in the award recipient honor. 3) The Emerging Researcher Award: is given to a psychologist who has made a substantial contribution to research in any area of psychology, is a full-time academician or scientist, and has received a doctoral degree within the past 10 years. Awardee receives a certificate and $100. 1) Undergraduate Student Researcher Award: This award is presented to an undergraduate psychology major attending a New Jersey college or university who demonstrates exceptional research potential as determined by his/her academic department. The awardee is invited to present their research as a poster at the NJPA Fall Conference and receives a certificate. 2) Graduate Student Research Award: This award is presented to a graduate student in psychology who attends a New Jersey college or university, or is interning in a New Jersey institution, or is an NJPA student affiliate, who has demonstrated exceptional research potential as determined by his or her academic department. This research should have been completed within the last two years. The awardee is invited to present his/her research as a poster at the NJPA Fall Conference and receives a certificate. 3) Master’s Thesis and Doctoral Dissertation Awards: This award is presented to graduate students in recognition of outstanding scholarly work— Master’s Thesis or Doctoral Dissertation from any specialty within a psychology graduate program in New Jersey. The works nominated should be superior in quality, design, and especially, represent a significant contribution to psychology or society as a whole. Each graduate program is asked to nominate one student in each category and forward two electronic copies of the thesis/dissertation to the New Jersey Psychological Association. Please provide contact information for the student, as well as the school. 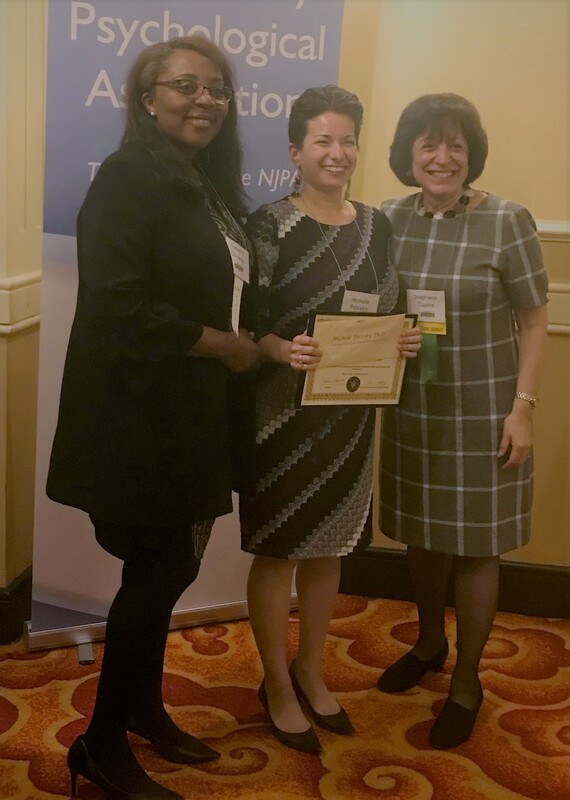 The NJPA Awards Program is part of a continuing effort on the part of the New Jersey Psychological Association to recognize and stimulate distinguished achievements by newly developing psychologists. 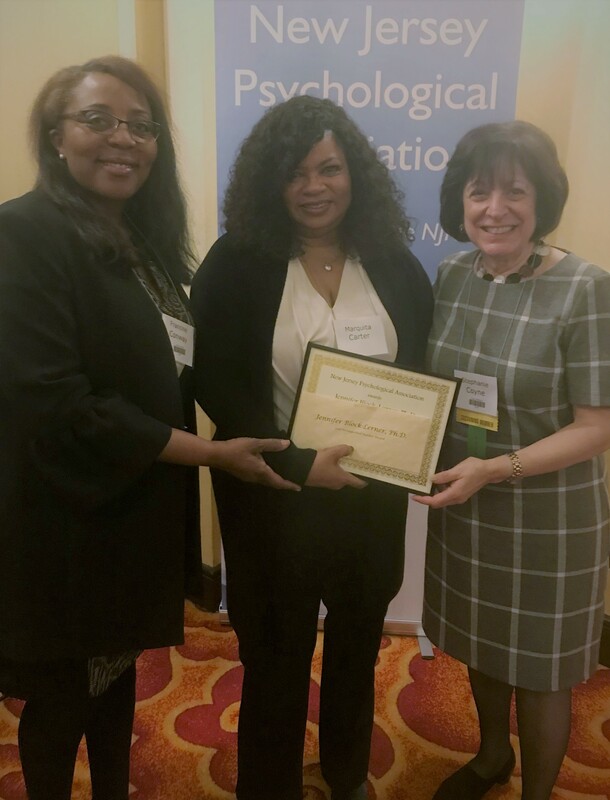 We wish to recognize excellence in psychology programs in the State of New Jersey especially those that nurture a high quality of student research. All award recipients are invited to attend our Fall Conference Award Ceremony where their work and contributions are recognized. Student award recipients are invited to present their scholarly work as a poster session held during the conference (see award descriptions). All applications are due July 5, 2019 and will be presented at our Fall 2019 conference. • Name, terminal degree of candidate and institutional affiliation. • Contact information—mailing address, telephone number & email of candidate. • Title of research presentation, thesis or dissertation if appropriate (depending on the award). • A 500-word statement describing the candidate's contributions/ reason for the nomination.